Do you need an electricity power source for your party? Fun 4 All DFW has got the POWER! Parties in the park are always sure to be a blast but most City Parks do not supply a power source. No worries! Our Generator Rental will take care of this problem. 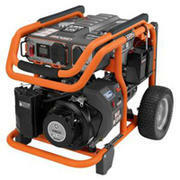 One of our generator rentals will come fully loaded with a tank of fuel included. Are you in search of some fun Inflatable rentals that will entertain your guests? We have lots of high quality Bounce Houses, Combo Bouncers, Water Slides, Dry Slides, Obstacle Courses, Inflatable Games and even an Inflatable Movie Screen. Thank you choosing Fun 4 All DFW here in Palmer, TX! Our team of party professionals are ready to bring the party to you with our outstanding generator rentals. We will arrive early to your event and have your rental set up quickly so you can enjoy the full 4-hour rental time. When you rent from us you can rest assured you are getting not only the best deal in the area but you’re also getting a clean and safe unit. Ordering online has been more simple then with our “Add to Cart” button featured on every page. Have additional questions or concerns? Please CLICK HERE to contact us directly.